Thousands descended on the city over the weekend to celebrate St. Pete Pride and its message of inclusion and diversity. 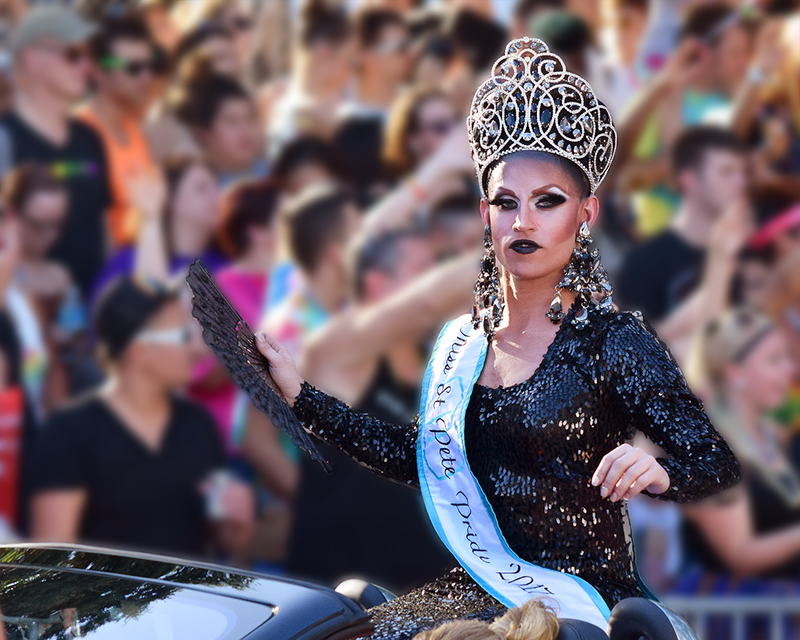 ST. PETERSBURG – Glitter, glitz and glam took over downtown streets this past weekend as thousands flocked to the city to celebrate St. Pete Pride. The rainbow flags; costumes of boas, sequins and fishnet stockings; and pulsing music were symbols of a celebration of diversity and acceptance. “I’m here because I am transgender and I am celebrating my freedom,” said Mya Purisch, 24, from Baltimore, MD, who transitioned two years ago. Childhood friends, Halie King, 22 and Juliana Kane, 18, both of Clearwater, and Madi Manilla, 19, of Tampa, said they wanted to represent a spectrum of diversity – gay, bisexual, straight – and to show that love spans all gender and sexual identities. “Love is all equal, all around. I’m here to represent that,” Kane said. St. Pete Pride takes place every year during June, which is National Pride month, a month commemorating, among other things, the Stonewall riots. New York City police officers raided a gay bar called the Stonewall Inn in Greenwich Village in the early hours of June 28, 1969, sparking an uprising that launched the modern gay and lesbian rights movement. The weekend’s events in St. Pete wrap up a month-long celebration that has grown to be Florida’s largest Pride celebration with participants coming from across the U.S. to take part. “It’s a wonderful outpouring of support, and it shows what a diverse and welcoming city we are,” St. Petersburg Mayor Rick Kriseman said. Not all those at the event were welcoming. A handful of protesters marched with bullhorns, waving signs that promised eternal damnation. They shouted scriptures and slurs at the crowd. It’s unclear if they represented one organization or group. They declined to talk with and turned their backs on reporters. Most Pride attendees ignored them. Some shouted back. Others, like Tampa resident Yasmine Avila, 27, were upset by their words. St. Pete resident Richard Lennox, 49, has been a regular Pride participant since it began 15 years ago and said the event’s success is bittersweet. Saturday’s (June 24) celebration was highlighted by parades – not only the 15th Annual Gay Pride Parade, but also the first-ever TransPride March. The march preceded the Gay Pride parade with a mini-parade by members of the transgender and gender-nonconforming communities and their supporters. Including the TransPride march was a first for any major Pride event in the U.S., according to Nathan Bruemmer, St. Pete Pride board of directions member. The main parade kicked off at about 7 p.m. amid the boisterous cheers of spectators. It traveled down Fifth Avenue onto Bayshore Drive. Forty decorated floats and nearly 150 parade participants sashayed, sparkled and strutted their way down the route toward Albert Whitted Park. Kriseman and U.S. Rep. Charlie Crist, D-St. Petersburg, joined in. At one point, the crowd quieted for a float that honored the 49 lives lost a year ago in the massacre at Pulse nightclub in Orlando. The festivities continued Sunday (June 25), which found the Grand Central district packed with an estimated 50,000 people. From 9 a.m. to 4 p.m., they danced to live music and wandered among more than 350 vendor tents; they meandered through shops that lined the avenue, and escaped the sweltering heat in bars, restaurants, and cafes. Splitting the two-day festival between the waterfront and the Grand Central District was also a first. 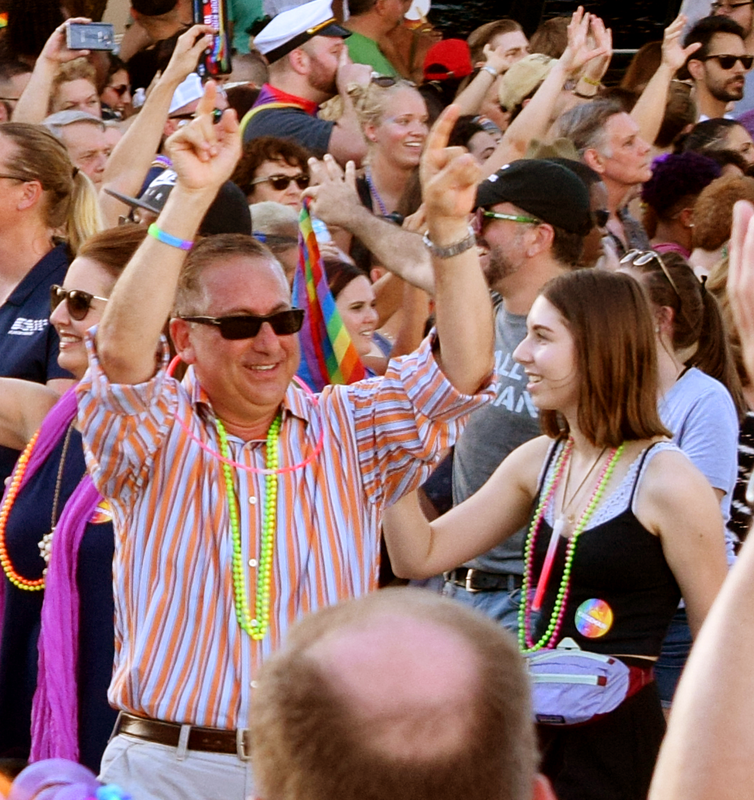 In January, board members for St. Pete Pride voted to move the event from the Historic Kenwood and Grand Central district to downtown St. Pete’s waterfront. The reasons included logistics, financial savings, and safety, according to Pride Executive Director, Eric Skains. It was a move that divided the community. A compromise was met, and though the parade launched the celebration along downtown St Pete’s Bayshore Drive, the following day’s street festival took center stage on Central Avenue where it had originated.